Heather Plett, gets to the heart of what it means to ‘hold space’. What does it mean to hold space for someone else? It means that we are willing to walk alongside another person in whatever journey they’re on without judging them, making them feel inadequate, trying to fix them, or trying to impact the outcome. 8. Allow them to make different decisions and to have different experiences than you would. 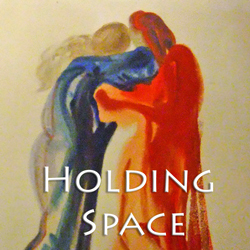 Holding space is about respecting each person’s differences and recognizing that those differences may lead to them making choices that we would not make. Sometimes, for example, they make choices based on cultural norms that we can’t understand from within our own experience. When we hold space, we release control and we honour differences. This showed up, for example, in the way that Ann supported us in making decisions about what to do with Mom’s body after her spirit was no longer housed there. If there had been some ritual that we felt we needed to conduct before releasing her body, we were free to do that in the privacy of Mom’s home. If you’re looking for a pdf version for printing and/or passing around to others, you can download it here. You’re welcome to share it, but if you want to re-publish any part of it, please contact the author.